This may turn you off Bloody Mary's forever. "So I purchased some Aldi tomato juice Dec 2016," she wrote, "To enjoy a bloody Mary over the Christmas hols [sic]." That Bloody Mary, though, never happened. "The carton it felt heavier than usual don't know why I felt the need to cut the carton open but I'm sure glad I did," she said. Beetle eggs can be found in your canned or frozen asparagus. The limit is set at 10% of the spear contains 6 or more beetle eggs or saks. Bugs can be found in your delicious apple butter. The limit is set at an average of 5 or more whole insects per 100mg of apple butter. Rot can be hiding in your canned beets. The limit is set at 5% or more of the weight. Mites may be hiding in your frozen broccoli. Less than 60 or more mites per 100 grams is deemed acceptable by the FDA. Brined or Maraschino cherries could contain maggots. The cherries are considered passable if they contain less than 5% contamination. There may be some rodent hair in your cinnamon. The FDA claims checkers find an average of 11% of rodent hair in ground cinnamon. Mildew may be lurking in your canned greens. The limit is set at 10% of the leaves containing mildew. Your favorite macaroni may have ant fragments. If the macaroni contains an average 225 fragments per 225g in 6 or more samples the product may be deemed 'adulterated'. Your apricot, peach, or pear nectar may have mold in it. The limit is a mold count of 12%. Your canned and frozen peaches may contain worms and mold! The limit is set at an average of 3% or more fruit by count. What she found was something horrifying. When she called the store, they said it would take six to eight weeks for the quality assurance team to help her. 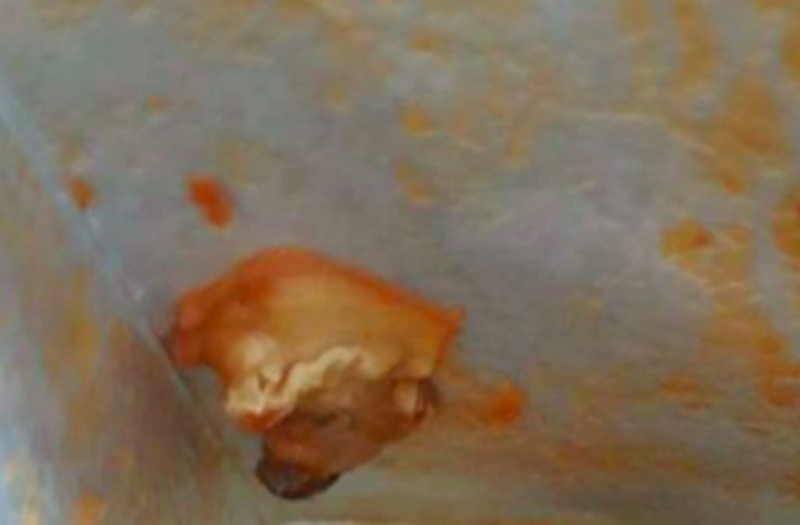 Aldi sent back a letter saying it was a huge amount of mold, and gave her a small voucher for £10 (around $13). An Aldi spokesperson spoke to the U.K. news outlet Metro about the incident: "We are very sorry to hear about Ms Smith's experience with this product." They continued, "Following Ms Smith's complaint, we conducted a full investigation, which identified the object as mold, possibly caused by a breach in the packaging that allowed air to enter."